It’s the expectations of today’s customers that drive Sunbelt Rentals to meet and exceed their needs. Sunbelt Rentals started out as a modest equipment rental business in North Carolina, providing general construction equipment in two locations. Fast forward 35 years and what a difference. Today, Sunbelt Rentals equipment — in its familiar bright green — can be seen dotting the construction landscape throughout North America. Just as the equipment rental market has grown over the last three decades, so too, has Sunbelt Rentals. The company now operates more than 700 locations and employs 10,000-plus workers in the United States and Canada. Firmly positioned as the second largest construction equipment rental company in the country, Sunbelt Rentals continues to expand its reach. The future for Sunbelt Rentals is looking strong and company officials say they are poised for bigger and better things ahead. In March, the company posted nearly $3.2 billion in revenue for the first nine months of fiscal 2018, compared to $2.6 billion for the same period in fiscal 2017 — a nearly 18 percent increase. “We finished a great third quarter and we will continue to experience growth,” says 20-year company veteran Kyle Horgan, senior vice president of business development, sales and marketing for specialty. “Our objective is not necessarily to be the biggest rental company but to be the best.”The company now has nine specialty divisions including Pump Solutions, Scaffold Services and Power & HVAC Services, which cover the gamut of construction segments. Beyond providing equipment rentals for the construction arena — in particular for utility and trenchless contractors — Sunbelt also responds with equipment and personnel in times of natural disasters. In 2017 alone, Sunbelt Rentals’ Emergency Response team, created in 2004, responded with assistance and equipment to three category IV hurricanes (Harvey, Irma and Maria) and one category I hurricane (Nate). Sunbelt Rentals was founded in 1983 in Charlotte, North Carolina, as a small rental company for general construction equipment. In 1990, The Ashtead Group, a publicly traded company on the U.K. stock exchange, purchased Sunbelt Rentals. Ashtead Group is an international equipment rental company with national networks in the United States, United Kingdom and Canada. Over the years, Sunbelt has expanded its equipment offering, as well as its reach. Its nine specialty divisions were created to better serve the company’s growing and increasingly diversified customer base. In 2014, Sunbelt entered the Canadian market with its acquisition of GWG Rentals Ltd. The company has remained in Charlotte all these years but recently moved to Fort Mill, South Carolina, located just across the South Carolina-North Carolina border. Even with 700-plus locations sprawled throughout the United States and Canada, the company’s management approach to how these businesses are operated is hands-off. “While we support all of our locations from Fort Mill, our businesses are very much decentralized. Every branch has the ability to do whatever it takes to service the customer, without much required from our field support office in Fort Mill,” Horgan explains. The trenchless market actually comprises a healthy portion of Sunbelt’s customers. 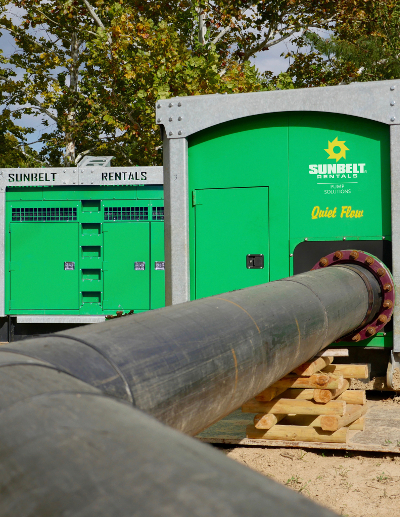 The primary equipment segment that the trenchless customer turns to at Sunbelt is its sewer bypass pump fleet. The trenchless market actually comprises a healthy portion of Sunbelt’s customers. 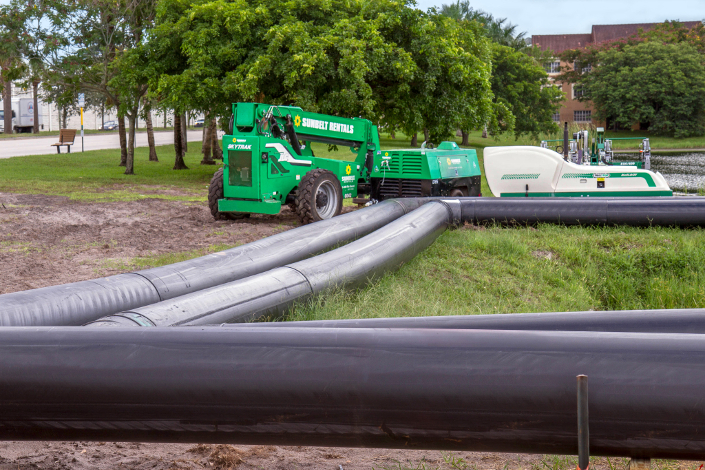 The primary equipment segment that the trenchless customer turns to at Sunbelt is its sewer bypass pump fleet, which ranges from small single-phase electric submersible pumps to big 18-in. sound attenuated pumps, as well as their accessories, such as valves and fusion machines. Sunbelt does not manufacture the pumps or any of its rental equipment but instead sources it from what company officials deem to be the best manufacturers specific to each product category; units are then branded with the company’s familiar green paint and logos. Horgan says the company has been involved in trenchless projects for more than 20 years. And they have been a part of some impressive projects, such as our 2017 Trenchless Technology Project of the Year for Rehabilitation, as well as an interesting project in Montgomery, Alabama. Horgan describes the trenchless market as a smart, strong and growing area that is evolving at a very fast pace. He says that customers know what they want and are savvy to what equipment is out there and how they want it to fit into their projects. “We’ve been doing turnkey sewer bypass projects for well over 20 years,” he says. “As the products, services and solutions geared to the trenchless industry have evolved, we have evolved our services along with it. Sunbelt launched a new, user-friendly website in January that is centered around enhancing the experience for site visitors and simplifying the equipment rental process. Part of what makes Sunbelt successful as a company applies specifically to the trenchless customer, with Horgan noting the experience of the company’s personnel, both at the home office and in the field, to handle whatever the project throws at them. It’s the expectations of today’s customers that drive Sunbelt Rentals to meet and exceed their needs, whether that is in the form of product or customer service. The competitive makeup of the rental business is not going away. “The rental market continues to grow, and there are a multitude of options out there. We want to make the decision to choose Sunbelt easy for our customers,” Horgan says. For a company to be around for 35 years and grow as much as Sunbelt has during that period, the rental market has to be doing pretty well — and it has. Project owners and contractors are turning to the rental option more and more as they put their projects together. According to Statista.com, a leading provider of market and consumer data, by 2021, the construction equipment rental market is projected to be at $54.9 billion. “Overall, the size of the equipment rental industry continues to grow,” Horgan says. “The overall construction market growth and contractors’ choice to hire out those services or rent those products vs. having to own all of it and perform all of it in-house continues to fuel the market. “I like to think that its companies such as Sunbelt that are making rental an easy decision for contractors. By allowing us to provide the products and services with a high level of expertise, contractors are able to expand their own level of expertise without having to own, manage and engineer these types of products and solutions,” Horgan says. He mentions that the quality and standards of the rental market have grown, as well, putting pressure on companies to meet customers’ needs and expectations — there’s more to it than just providing the product to the customers. To that end, Horgan says Sunbelt goes beyond what is expected and provides an elevated level of service that differentiates the company from other rental providers. He points to the quality of the equipment offered and the expertise that comes with it. One aspect of Sunbelt that company officials are particularly proud of is its ties to hiring and supporting military veterans. Company officials estimate that nearly 10 percent of its workforce is comprised of current and former service members. On social media, such as LinkedIn, Sunbelt spotlights one company veteran each month, thanking them for their service. Since 2016, Sunbelt has partnered with the Gary Sinise Foundation on its R.I.S.E. program (Restoring Independence Supporting Empowerment), which provides specially-adapted smart homes for the U.S.’s most severely wounded veterans and their families. Through its partnership, Sunbelt supplies tools and equipment to the contractors on each home build, at no charge. The company also produces uniquely-branded boom lifts and generators that feature a patriotic design with the foundation’s logo; a portion of rental proceeds from these units is donated back to the foundation each year. “This is something we enjoy being a part of and take enormous pride in,” Horgan says.